Strawberry is my all time favorite summer fruit. 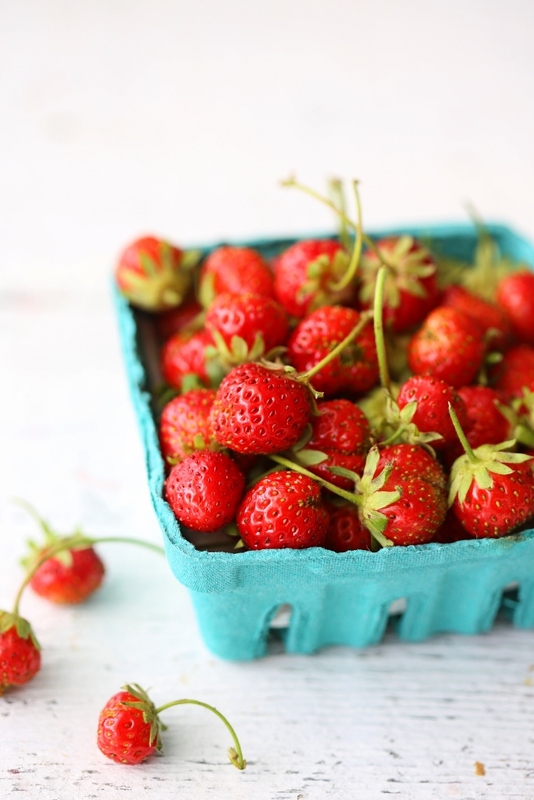 I’m not talking about the typical big, flavorless strawberries that you find at the supermarkets but the wild French strawberries, known by their romantic name, Fraises des Bois. My husband’s aunt first introduced me to these strawberries when we visited her in Seattle many summers ago. They grew wild in her garden and seemed to thrive in the Pacific Northwest climate. These strawberries are tiny and delicate but exquisitely sweet. Ever since, I look for them around June to July at the farmers market. 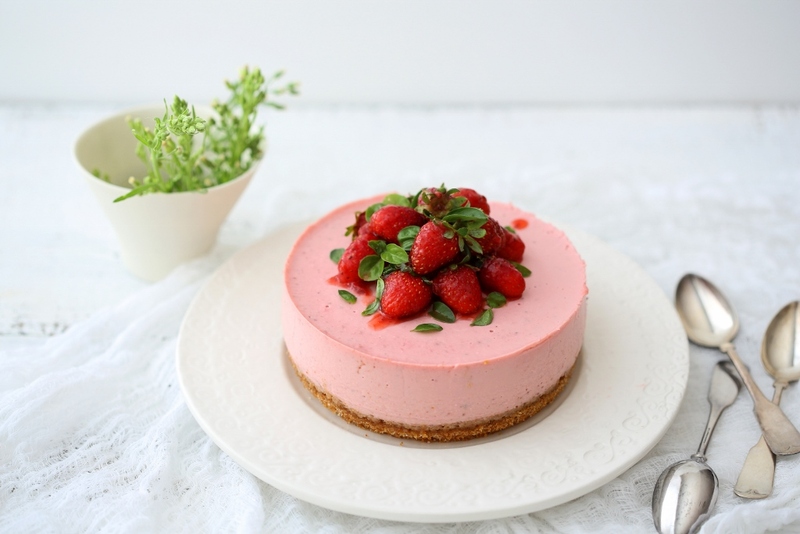 I usually eat them fresh or use them in one of my favorite desserts, strawberry and basil cheesecake. The best thing about this cheesecake is how little work you put in for the delicious result that awaits you. The texture is light, almost like a mousse and the addition of the basil leaves creates a tsunami of flavor. As much as I love a peach cobbler, plum galette, or apricot crumble, this cheesecake is hands down one of my favorite summer desserts. 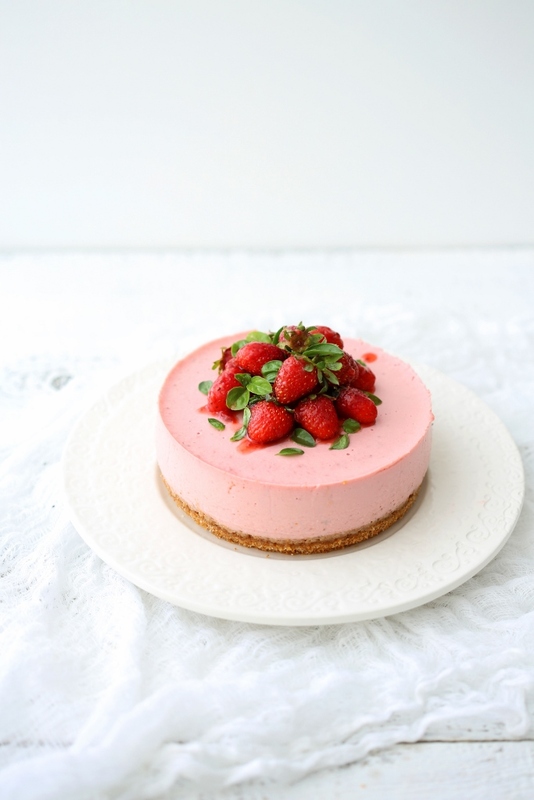 Near the end of strawberry season, I will make an extra cheesecake and keep it in the freezer for up to two months for when the craving hits hard. 1. Add 1 pint of strawberries with 2 tablespoons of powdered sugar and let macerate for 15 minutes. Process the macerated strawberries in a food processor until smooth. 2. In a medium saucepan, heat 2 tablespoons of water on low heat. Add the gelatin and cook for 2 minutes, stirring constantly until the gelatin is dissolved. 3. Add the milk, heavy cream, cream cheese, mascarpone cheese, sour cream and granulated sugar to the saucepan and whisk on low heat until smooth. 4. Remove the mixture from heat and add the strawberry puree and lemon zest. Puree the mixture with a hand-held blender and strain with a sieve to ensure a smooth texture. Let it cool completely. 5. In a large bowl, combine the grounded Graham crackers, sugar, and butter and stir until well blended. The mixture should stick together when squeezed firmly in your hand. 6. Transfer the Graham-cracker mixture to a 8-inch springform pan and press the mixture firmly onto the bottom of the pan. Refrigerate for 30 minutes. Bake until golden brown at 350 degrees F for about 10-12 minutes. Remove from the oven and let it cool completely. 7. Pour the chilled filling into the crust and refrigerate for 6 hours or overnight. 8. To make the basil infused strawberries, stir water, sugar, strawberry jam, lemon juice, and basil leaves in a small saucepan over low heat until the jam melts. Bring the mixture to a boil for 2 minutes and remove from heat. Stir in the strawberries. Discard the basil leaves. 9. 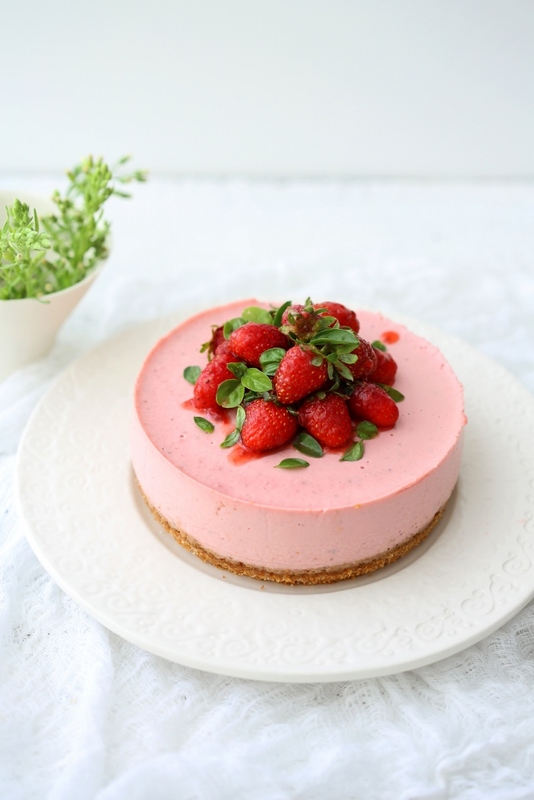 When ready to serve, unmold the cheesecake, top with the basil infused strawberries, and scatter the micro basil leaves on top.